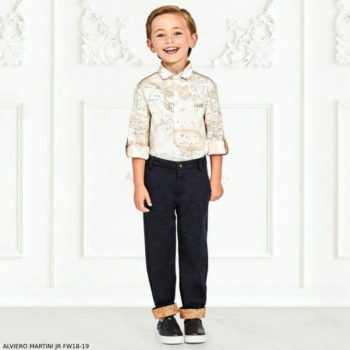 Love this special occasion look for boys – ALVIERO MARTINI Boys Blue Geo Map Shirt & Blue Jeans. Every boy needs a blue dress shirt in his wardrobe, especially one with a twist, and this Alviero Martini design fits the bill. This boys light blue shirt by Alviero Martini is made in fine cotton with all-over Geo map print. 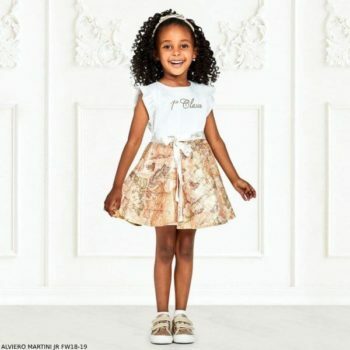 It has dark beige trims on the shoulders and cuffs, and dark beige Geo map print on the inside collar and cuffs. Looks perfect with a pair of boys denim blue jean pants for boys by Alviero Martini, made in a soft relaxed denim. They have the designer’s signature Geo Map print, with beige print trim on the leg turn-ups and back pocket. Complete the look with an Alviero Martini Navy Blue Dress Coat. Shop Online. Ships Worldwide.